American Canyon High School junior varsity girls basketball players celebrate their JV Wine Valley Tournament title Saturday at Vintage High. They are, front row from left, Azure Aalona, Kaia Ojascastro, Kym Enriquez, Erika Culanay, Reiko Asahara, Sabrena Sarrouli, Monique Thomas, second row, Daijanea Barnard, Trinity Tapia, Sierra Smith, coach Angela Davis, Bella Tapia, Pryia Pahal, third row, Mariah Carlyle and Lauren Summers. 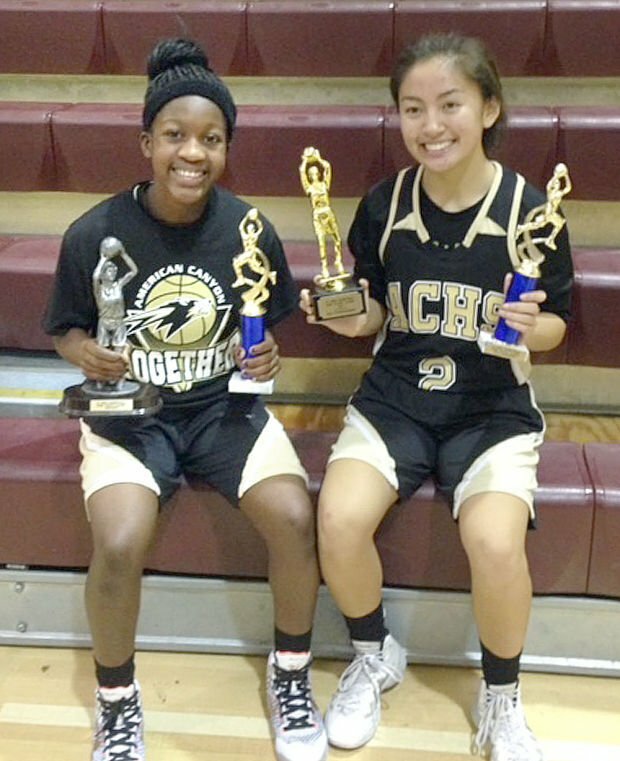 American Canyon's Daijanea Barnard, left, and Bella Tapia made the JV Wine Valley Tournament's All-Tournament team. American Canyon's Daijanea Barnard was the JV Wine Valley Tournament's Most Valuable Player. 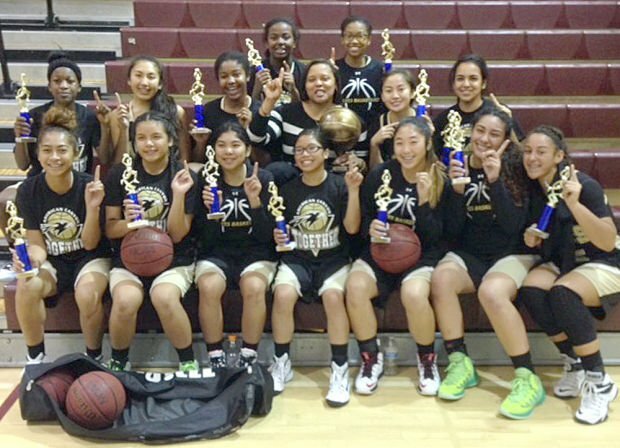 The American Canyon High School junior varsity girls basketball team won the JV Wine Valley Tournament title, beating Napa in the championship game, 35-28, Saturday at Vintage High. The Wolves were down 20-12 at halftime and trailed 26-21 at the end of the third quarter. But American Canyon’s press and man to man defense held Napa to only two points in the fourth quarter. The Wolves also had wins over Justin-Siena, 32-19, and Rodriguez, 48-27. Most Valuable Player honors went to Daijanea Barnard and All-Tournament honors went to Bella Tapia.